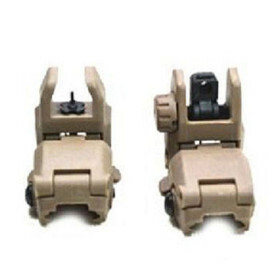 AR Tactical Back Up Sights Set (Front & Rear Flip Up) » Protective Solutions, Inc. The AR Tactical Back Up Sights Set includes both Front and Rear sights. Color is Flat Dark Earth. Spring loaded flip-up design, release lever can be reached on left, right & top position. Height above rail, stowed is 0.51"
Length, deployed above rail is 1.5"